A tasty and tasty bread, made with pumpkin. Milk inside Nucleo® Zucca makes bread particularly soft and therefore suitable for tasty and nutritious snacks. 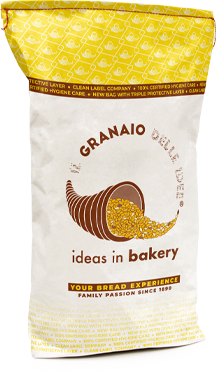 Il Granaio delle Idee suggests it for the production of raisin sandwiches, with chocolate drops or other inclusions, according to the imagination of the baker. Nucleo® Zucca gives the finished product an unmistakable bright and bright colour, thanks to the pumpkin among the ingredients. Sesame Black and Poppy Decoration is available on request.